If someone told me that the lifelines on our boat were the 30 year old originals, I would agree. 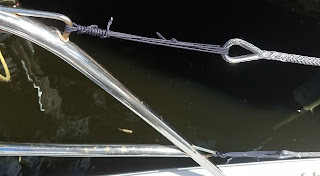 They were the Stainless Steel Wire type that is covered in White Vinyl and tensioned with Stainless Steel Turnbuckles and very old style pelican hooks. About a month ago, I fell onto the lifeline near the bow of the boat from the dock while congratulating Peggy on a great docking maneuver, that caused the stanchion damage which required they be replaced. The turnbuckles had seized and had to be cut off. and that meant new lifelines. Would it be ok to hang fenders from the Dyneema line? Well, I no have not secured a fender to the top life line in ages because I'm worried about bending the stanchions. I now secure the fenders to the base of the stanchions. There are reports about Chaffing Dynmeea. This is an issue with the Dyneema, but it's so strong, that it will have to chafe a lot before I would be concerned - And as one of the guys on the C34 forum often says, the lifeline is just to show where the edge of the boat is located. It's not to provide a grab rail. Is it difficult to work with? Turns out it's a whole lot easier than splicing double braid line and simple tools that don't require heavy duty stainless steel crimping. Lifelines are exposed to UV, is that a problem? The Dyneema that I purchased has a UV coating - and it's so much easier to replace that the low cost and ease of replacement eliminates that concern. 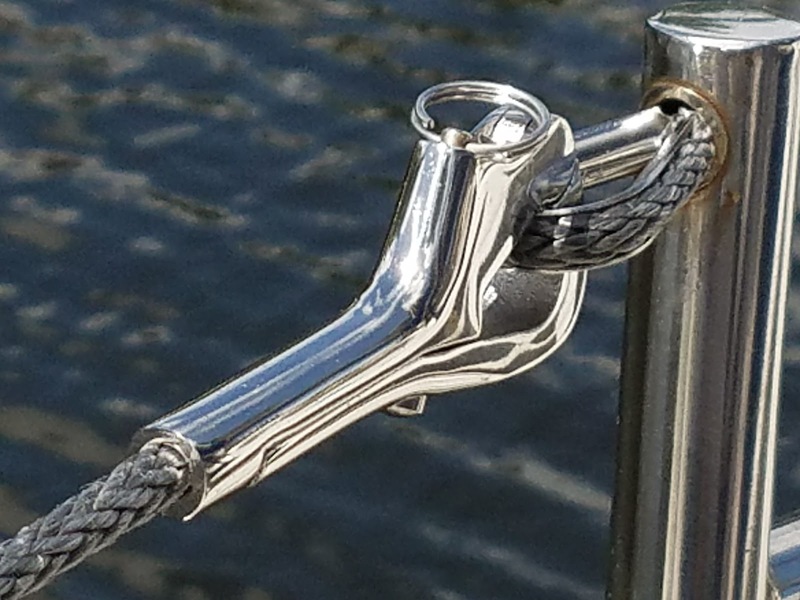 How does the line connect to a Pelican hook to ease opening and closing the lifelines on either side of the cockpit. - I came up with a solution for that which works for me. I found the Amsteel on Amazon, it was being sold at a really good price, but the 1/4" 100' is no longer available at that price, I looked today and only found 600' for close to $600 - so search around. I Used a 4.5" Angle grinder to cut off the old seized lifelines & turnbuckles. That's 8 lines! Port & Stbd aft upper & lower lines & pelican hooks, Port & Stbd Main lifelines, upper and lower. Following many You-Tube videos, I spliced a thimble onto one end of each line and temporarily secured that to the pulpit (upper lower port & stbd main lines) and to the aft pulpit (upper lower port & stbd main lines) with a long length of lashing line. For the main lines I ran them through the stanchions all the way aft and through the aft most stanchion and marked the line where it came out of the stanchion. Then releasing the lashings at the front of the line connecting it to the pulpit, I spliced a thimble onto aft end of each line and redid the lashing to pull the splice into the holes of the aft-most stanchion. Now the aft most thimble is tight up against the stanchion. Next I threaded each of the forward end of the aft lines through a new pelican hook. 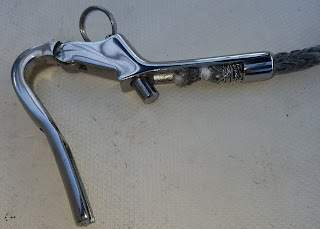 I used the lashing line to whip the end of the Dyneema to create a binding that would not pass through the threaded tube of the Pelican hook, but small enough that it would allow the pelican hook to close. That worked well, but when a friend leaned heavily on the lifeline, that binding came out of the pelican hook. So I then replaced the lashing line with Stainless Steel Locking wire and that will not slip through the Pelican hook. I'm really pleased with the results. I did change the design slightly, moving the Pelican hooks to the forward end of the aft lines, now the lines drape nicely over the Bimini and pulpit frame when they are open and it's easy to close them. The Pelican hooks attach to the Thimbles on the aft end of the main lifelines. It works very well. I am left with quite a bit of the Amsteel line, so I'm making several things using that. A spliced loop to attach my new Anchor Snubber to the Chain, Lanyard to secure our Winchrite cordless winch handle to eliminate the risk of it falling overboard if it jerks to a stop, and as many Soft Shackles as I could ever need. Followup. It looks like I was really lucky to get the 200' of Amsteel 1/4" line for $86! At the much higher price now online it would make it a tougher call to choose between Synthetic line and Stainless Steel. However, the ease of doing this project using the synthetic line would still push me to using it over the Steel option.